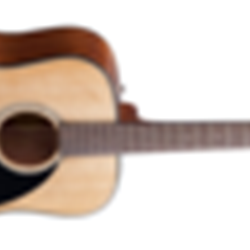 MORE ABOUT FENDER DG-8S ACOUSTIC PACK We've made our top-selling DG-8S Acoustic Pack even better by upgrading its full-sounding, easy-playing dreadnought guitar with even finer features. These include a slightly re-shaped pickguard and rosewood bridge that give a nod to the Fender acoustics of the 1970s, new 3mm dot markers that lend an elegant touch to the fretboard, and a simple-but-striking mother-of-pearl acrylic rosette. Other features include a solid spruce top with scalloped and quartersawn "X" bracing for balanced tone, mahogany back and sides, mahogany neck with 20-fret rosewood fretboard, neck and body binding, and Graphtech Nubone nut and compensated bridge saddle. Pack includes everything needed to start playing, with gig bag, chromatic electronic tuner, strings, picks and strap and instructional DVD.